For those who do not know me, my name is Shahar Larry. I’ve spent most of my career as an innovation consultant and an entrepreneur. Over the past 6 months, I have been making my first steps into the world of Cryptocurrencies, blockchain, and ICOs. This article is part of a diary-like notebook that I am keeping. It all started when I figured that there must be other people like me, looking to better understand what’s what. I’ve spent over a decade working with companies of all sizes and shapes – from Fortune 500 companies to early-stage tech startups – mostly on strategic innovation. Looking at the forefront of technology, innovation and trends was my job. It was, still is, a lot of fun. A few years ago I pivoted a bit (here’s a piece about why I did that) and changed my focus to disruptive technologies (technologies that change the fundamental assumption of existing industries – for more look here). During that time I developed a theory I call Nostalgic Innovation that basically defines a category of tech-driven innovation that enables us to realize more natural, humanely desireable results. For more about Nostalgic Innovation check out this piece. I think blockchain is one such Nostalgic Innovation – which is why it is changing the world, underneath our feet. First a bit of background. Human interaction can be reduced to a simple give-get relationship. It could economical/commercial, like a trade in which I give you some fruit and in return, you give me a bag of flour. It could be communicational, like me giving you my thoughts, ideas and arguments and you sharing your feedback. There might be other types, I do not want to go into the full scientific taxonomy of human interaction. The point is that since the dawn of time, people would interact with other people on a give-get basis. Dispute Resolution – Per our fruit-flour exchange above, you may claim that I stole your bag of flour and never gave you fruit. Me being a party to the deal makes my ledger a weak evidence to the contrary. Fruit-flour exchanges may seem trivial, but when humans started keeping more significant property, like property, keeping an unbiased, central, ownership record (ledger) became valuable. Taxes – With the development of agriculture, around 10,000 years ago, human beings started changing their lives from small hunter-gatherer communities to large congregations and later cities. Agriculture allowed us to grow more food per given land and could support large groups of people. These developments brought about central governing bodies. I am not talking about the community paying for it’s leader’s expensive lifestyle, or even taxes for wars (that were in some cases, economically profitable, at least for the concurring side). I’m talking about taxes that were collected to build and maintain infrastructure and to provide services such as keeping a central ownership ledger. Now the central bodies had another reason for keeping records – it allowed them to collect tax. All we wanted was a fair trade and unknowingly we created a self-perpetuating bureaucracy (and the dreaded phrase: “Permanent Record). The thing is that for many years, there was simply no alternative and in general central bodies did provide needed services to the population – as Monty Python demonstrated. With the benefits came problems. One major problem was the systemic risk that central databases have – if they are hacked, or lost, or burned – we’re f@#$ed. Other problems were that it was slow, expensive, not equal to all, etc. I’m not sure when or how exactly blockchain was invented. I found this patent from 2006, for a distributed, automated ledger, made public in 2010, Charles Moore. I don’t know if this was the first blockchain patent (I did not delve too deep, but I think it might – please comment below if you have more information). The idea of blockchain is to create a public transaction record that allows us to confirm transactions without all of the downsides of a central body. Blockchain – as the name suggests is a chain of blocks of data. The data includes the transaction, a timestamp, a link to the previous block (this is why it is a chain) and some information about the work invested in creating the block (these blocks are created by Miners – more on that, some other time). There are other types of blocks and other functions, but I don’t want to get too technical. Open and Public yet Anonymous – The blockchain is open and public which means that all transactions recorded are available to anyone to see. At the same time, the records are anonymous – parties are identified by matching a key to a lock with revealing their identity. This mechanism makes the blockchain very difficult to manipulate – everyone can see everything that is happening on it and transactions have to be confirmed from multiple sources. 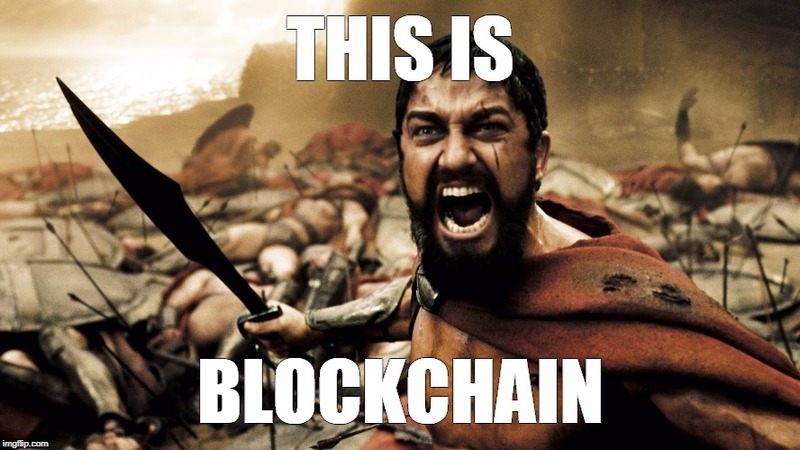 Distributed or decentralized (I don’t think there’s a difference) with many copies and therefore sturdy and secure – Tyler Durden’s apocalyptic vision is not applicable to blockchain. Self-regulating and Disintermediated – Blockchain does not imply anarchy. There are internal rules that govern the actions applicable in creating the blocks (and once a block is created, confirmed and added to the chain, it cannot be altered). Copies of the entire blockchain are held in special nodes (Miner who are adding new blocks) in the network and are constantly synchronizing. These internal rules and distributed architecture create a self-governing system (making a central intermediate superfluous). We don’t need a bookkeeper or a city record clerk. We don’t need other more voracious intermediaries such as brokers. It makes transacting fast, cheap and more natural as it is simply two parties transacting directly with one another. This is why I like blockchain so much. It is taking us back to pre-civilization, to the most natural, direct way of transacting (without blowing anything up and without the risk anyone else would do it). It is a technology that allows us to behave in a clear, simple and natural way and at the same time, it is safe, secure, scalable, instantaneous and global. Blockchain technology is still marred by various challenges. However, its importance and potential impact are almost incalculable. Blockchain technology is applicable in any domain that has enough users that interact/transact. That’s about, well, everything, right? Last comment – I suspect that blockchain will become an enemy of the state soon enough. It has the potential and power to make many (I don’t think that all, at least not until machines become people) of the functionalities of government obsolete. I don’t think governments will shrink without a fight. It’s gonna be interesting. My money is on the blockchain (pun intended). 1. Are there no other solutions for the problems of centralized ledgers? 2. What new problems does blockchain introduce? 3. It requires a lot of extrapolation to go from there to “mak[ing] many… functionalities of government obsolete”. Government exists to provide a lot more services than centralized ledger maintenance… like maintaining law and order, foreign relations, education, and building infrastructure. Or do you believe this can be run by a nation of 300 million people without government? I won’t even get into the subject of cryptocurrencies, since you didn’t… and it’s quite a vast subject. Most interested in your comments. Thanks!